To satisfy their clients’ requests—which included views of the water—REEF aimed for the sky! On a postage-stamp sized lot in Dennis sits a beautiful, 2,700-square-foot home with front porches that boast sweeping views of Cape Cod Bay, from the Pilgrim Monument in Provincetown to the Sagamore Bridge. This charming residence is the result of a collaborative effort between an experienced and creative design and build team, and the owners of the property who had a vision for their Cape Cod retreat. With just a fifth of an acre of land, though, satisfying all of the other “must haves” on the couple’s list—including four large bedrooms, a two-car garage and a spacious, open floor plan—was going to require a talented design team and a skilled builder. 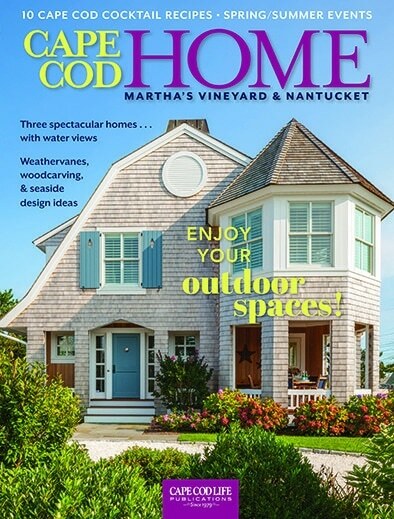 The homeowners found both in REEF Cape Cod’s Home Builder. “From day one, I considered how we could get the maximum capacity out of the lot,” says Jim Hagerty, REEF’s vice president and the lead designer on the project. “I tried to assess how high we could go and what we could do to take advantage of the grade.” Because the lot slopes down on the right side of the property, an oversized two-car garage fit nicely beneath the home. With that achieved, Hagerty focused on the next priority: a million-dollar view.